Read a sample chapter: A Can of Bull? Do Energy Drinks Really Provide a Source of Energy? Teaching notes and answer keys are available for download directly from the authors at www.nccsts.org/nsta_quant.html. The editors of this book present a compelling case that in order for students to better understand science, an increased level of quantitative reasoning is needed. One manner of achieving this is to place science concepts in the context of case studies which require such reasoning. 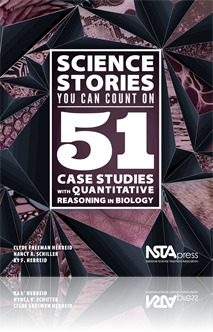 This book provides a roadmap for using case studies and quantitative reasoning to learn biology; it is perhaps best suited for high school advanced placement and college level introductory biology instructors. Tackling the twin problems of routine science memorization and math phobia, the authors have put together an exciting as well as inviting series of case studies to intrigue the student while honing the critical thinking skills. ... Both the diversity of topics and the reader friendly approach should capture students’ interest while engaging them in scientific questioning coupled with the exercise of numeracy skills. While both hefty in content and weight (a ringed binder would be useful), this is a resource to be added to the introductory science course curriculum. While designated for the college level, this publication would also work well at the secondary level. I got this book last year at the National Conference in Chicago. While I have used it some, it is very advanced mathematically. Teaching high school biology and honors biology, my students do not have the math background to complete a lot of the case studies as written. I have to modify most of them for use. However, I have found that they also make for good writing prompts when I give students the background information and prompt them to write about what they would expect or what they would look for as the researcher.